We don’t know about you, but we love summer, and we’re thrilled to welcome the arrival of Midwestern Gothic Issue 10! The Summer 2013 issue collects fiction and poetry from a diverse bunch of authors and explores what life in the region is all about. 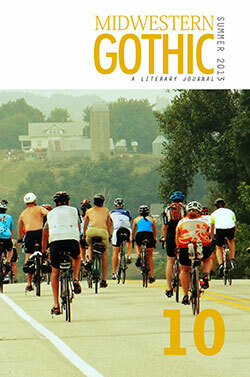 Issue 10 is available in hardcopy ($12) and eBook formats ($2.99), including Kindle, iPad, and PDF. Click here to pick up a copy. This issue features work from contributors Frank Bill, Kyle Brown, Ben Cartwright, Joan Colby, Brandon Courtney, Leesa Cross-Smith, Amber Edmondson, Doug Elwell, Stephanie Frazee, Elin Hawkinson, Ray Holmes, Jane Hoogestraat, Nathaniel Lee Hansen, Dani Johannesen, Jeff Kass, Tyler Koshakow, Amy Krohn, Jen Marshall Lagedrost, Michael Lambert, Nicholas Mainieri, Kara McKeever, Kassandra Montag, Sarah Fawn Montgomery, Katie Darby Mullins, Dale Patterson, Jason Prokott, Suzanne Reeder, Gregg Sapp, Michael Schmeltzer, Jared Yates Sexton, Troy Schoultz, Brian Short, Michael Shou-Yung Shum, Shannon Smith, Alida Winternheimer, and Brigit Kelly Young.